For women who want to conceive, there is nothing like seeing a positive result on a pregnancy test. Ovulation and pregnancy test kit accuracy is of the utmost importance, and Medical Disposables makes sure you have all pertinent information needed to make an informed decision. Our ovulation and home pregnancy test kits are up to 99.9% accurate and easy to use. Our pregnancy tests use a urine sample to determine whether or not a woman is pregnant. A urine pregnancy test looks for human chorionic gonadotropin (hCG), which is a reliable marker for pregnancy. Different tests have different sensitivity levels, which is a factor in how early pregnancy can be detected. With Ultra Sensitive Early Detection Pregnancy hCG Strips, you can know if you’re pregnant in as little as eight days after ovulation. It is able to detect just 10 miu/ml of hCG, making it one of the most sensitive tests on the market. Starting or expanding your family is much easier when you know exactly when you are ovulating. Ovulation is the small window in a woman’s monthly cycle when pregnancy becomes possible. 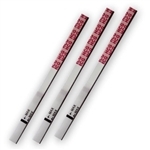 The most accurate method for determining when ovulation occurs is with ovulation test strips. Ovulation test strips from Medical Disposables are guaranteed to be accurate and give rapid results. The ovulation test detects the Luteinizing hormone (LH). There is an acute rise in LH production during ovulation. This LH surge triggers ovulation, and our test detects this surge. The results can be used to know when ovulation is at its peak level and improve your chances of getting pregnant. Order an ovulation or home pregnancy test kit by 3pm to receive same day shipping, and get FREE Shipping when you purchase $50 or more.